Hi everyone. There are two new challenges up today that are both "Christmas in July" ... how perfect is that??!! So I'm entering this card into the Paper Players Challenge #153 and CAS on Sunday Challenge #12. 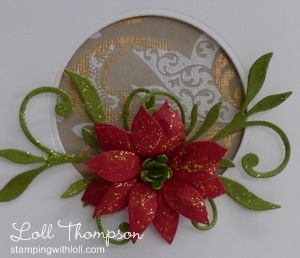 I created a 3-D poinsettia using my Memory Box "Blooming Poinsettia" die. If you're interested in knowing how I made the poinsettia, check out my tutorial. I spent ages yesterday writing and photographing for the tutorial. Not completely happy with the pics, but after several hours I was at the "this will do" point :) It's the first tutorial I've written in over a year and I am a little out of practice. Labels: christmas, crafty ann, poppy stamps, spellbinders, Stampin' Up! Loll, I just love Xmas in July, makes me so anxious for that cooler weather!! 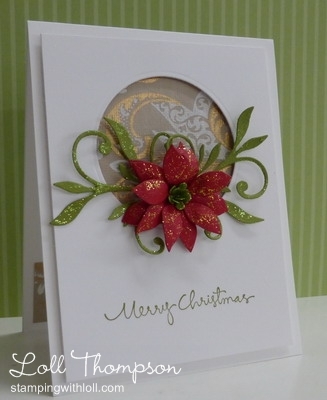 And your card Is so very pretty, that poinsettia is just so vibrant with the gold glitter on it, wonderful touch!! And I love the choice of flourish, had not seen that one before, thanks! Gorgeous! So lovely with the dp in the aperture (what a great find!). I love the idea of painting the poinsettia with gold glitter glue - I've filed that away for future use! And thanks for the tutorial (great idea to use an emery board cut in half to sand off the rough edges). Really amazing. Looks so beautiful. You have it going on! How elegant! I love the glitter on your flower. Really beautiful! This is beautiful, Loll! Love the glitter on the flower and the leaf flourishes! I love all the dimension on this card, Loll! And the die cut flourish with leaves is adding to my wish list! Love the aperture and the simple sentiment! Now I'm off to check out the tutorial. Thanks for doing that. I have a friend who told me today she finished her 100 Christmas cards this weekend... If I didn't love her so much I would hate her... just kidding. Your card today made me think of her! I loved your tutorial! What a lot work, but we thank you. You did a great job...easy to follow to get the job done right. Your Poinsettia is just beautiful!!! this is stunning and I LOVE how your framed the flower as well as let the colors of it be the focal point of the card. Fabulous card, and love how you did the diecuts over your beautiful DP. Great idea to do this, and your poinsettia was lovely. I shall be back to view the tutorial (unpacking, doing laundry today and happy to be home as well). TFS & beautiful Christmas card. So grateful you do the tutorials. I enjoy them. Another gorgeous card, Loll! The dsp peeking from the die-cut window is lovely and the poinsettia is stunning! So glad you shared this beauty with us at The Paper Players! Wonderful card...amazing that the beautiful gold DP came from the dollar store! Your poinsettia is gorgeous. I have already checked out the tutorial and you did a great job! Thanks for the emery board tip and the shading tip...great ideas. Absolutely stunning, Loll. The poinsettia in front of the die cut circle is breathtaking! Thanks for playing with The Paper Players!